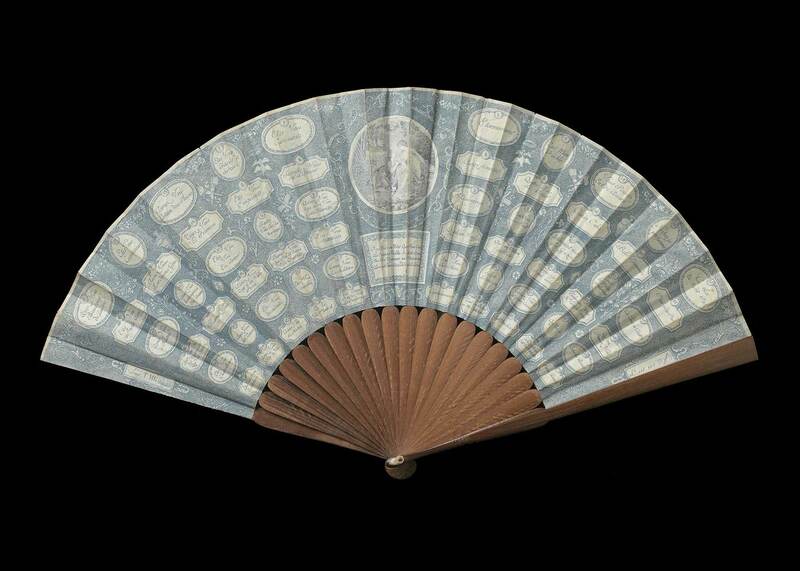 While fans were a staple of the eighteenth-century woman’s wardrobe, visitors to the exhibition Fans of the Eighteenth Century at the de Young may be surprised to learn that these accessories were also useful social tools. There is the angry Flutter, the modest Flutter, the timorous Flutter, the confused Flutter, the merry Flutter, and the amorous Flutter. 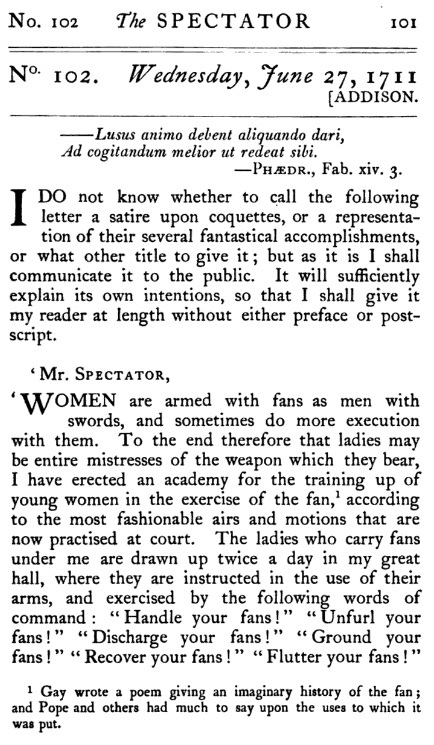 Not to be tedious, there is scarce any Emotion in the Mind that does not produce a suitable Agitation in the Fan; insomuch, that if I only see the Fan of a disciplin'd Lady, I know very well whether she laughs, frowns, or blushes. I have seen a Fan so very angry, that it would have been dangerous for the absent Lover that provoked it to have come within the Wind of it; and at other times so very languishing, that I have been glad for the Lady's sake the Lover was at a sufficient Distance from it. I need not add, that a Fan is either a Prude or Coquet according to the Nature of the Person that bears it. Various sources mention users wielding their fans in accordance with coded “languages,” in which fans were positioned in different ways to spell out individual letters, form words, and convey surreptitious emotions and desires. While it is unclear to what extent these languages were actually used – spelling out individual letters, for example, would have been quite cumbersome – some enterprising fan makers did interpret them into aid-to-memory “Conversation Fans” (whose designs were formed by directions for spelling words) and romantic question and answer games. 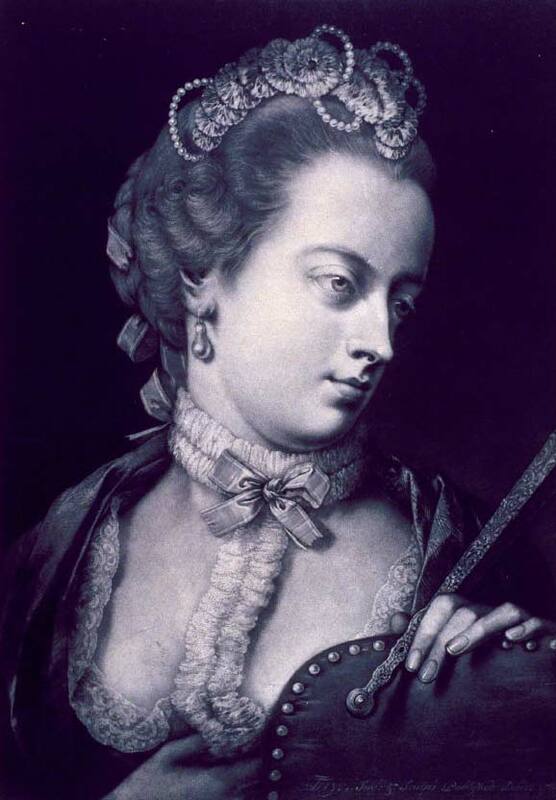 Alexander, Hélène. Fans. London: B. T. Batsford, 1984. Armstrong, Nancy. A Collector’s History of Fans. New York: Clarkson N. Potter Inc., 1974. Armstrong, Nancy. Fans in Spain. London: Philip Wilson Publishers, 2004. Bennett, Anna Gray, with Ruth Berson. Fans in Fashion: Selections from the Fine Arts Museums of San Francisco. San Francisco: Fine Arts Museums of San Francisco; Rutland: C.E. Tuttle, 1981. Casanova, Giacomo. History of My Life. New York: Alfred A. Knopf, 2006. Commoner, Lucy. Folding Fans in the Collection of the Cooper-Hewitt Museum. New York: Smithsonian Institution, 1986. Steele, Valerie. The Fan: Fashion and Femininity Unfolded. New York: Rizzoli, 2002.